How will the Fast Start checklist help me and my business? Now that most marketers see that content marketing is at the heart of digital marketing, it's becoming more difficult to make your content marketing effective. To compete in content marketing needs an approach where you work to a plan to develop more engaging content than your competitors and work hard to improve this. This checklist will help you if you're responsible for content marketing to understand what needs to go in your plan and how you can optimise content marketing. What does the managing content marketing checklist cover? In our research, our members tell us that they love the comprehensive explanations and recommendations in the 7 Steps to Success guides in our channel toolkits. But they also say that shorter checklists to help them review and plan their tactics better would be useful too. These are our ‘Fast Starts’, aimed at helping you rapidly create a plan. 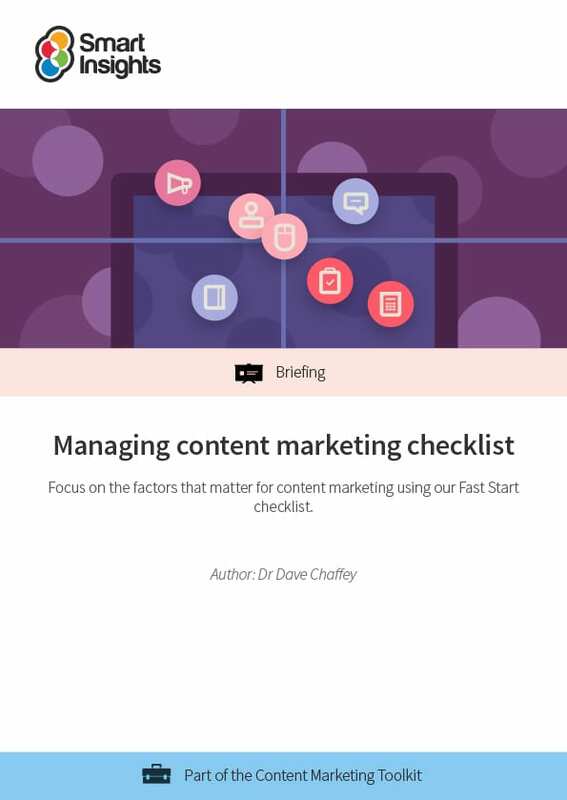 This guide from Dr. Dave Chaffey is a Fast Start checklist of 22 factors to manage for better results from content marketing which fuels SEO, Social media marketing and conversion. Dave is co-CEO and co-founder of Smart Insights. He is editor of the 100 templates, ebooks and courses in the digital marketing resource library created by our team of 25+ Digital Marketing experts. Our resources used by our premium members in more than 80 countries to Map, Plan and Manage their digital marketing. For his full profile, or to connect on LinkedIn or other social networks, see the About Dave Chaffey profile page on Smart Insights. Dave is author of 5 bestselling books on digital marketing including Digital Marketing Excellence and Digital Marketing: Strategy, Implementation and Practice. In 2004 he was recognised by the Chartered Institute of Marketing as one of 50 marketing ‘gurus’ worldwide who have helped shape the future of marketing. Individual and Business members get full access to this and 4 other guides in the Content marketing Toolkit.